When I was very young, no more than six, I found my way into Narnia. CBS produced an animated adaptation of The Lion, the Witch, and the Wardrobe, directed by Bill Melendez, one of the lights behind CBS’ Peanuts cartoons. I was really taken with the movie, and my parents bought me a boxed set of C.S. Lewis’ Narnia books. I read through all seven, at age six, and my mother tells me that that I could, at the time, explain the religious symbolism in the series. I reread the Narnia series in ’96. Then I started it again in ’05 when the Disney film came out, only to bog down in the middle of Prince Caspian (for which I blame the revisionist series order, which I disagree with altogether). When last I read Lion in ’05, I didn’t see the Christian allegory. I know, now, going in that Aslan is a deity of some stripe — Lewis intends Jesus, Neil Gaiman makes an argument that Aslan is a pagan deity in “The Problem of Susan,” Liam Neeson thinks that Aslan can represent Buddha or Muhammad — but nothing else makes a lick of sense. I’m not clear on what the White Witch is meant to represent Biblically, and Father Christmas as a Narnian arms dealer in Lion doesn’t really work. Suffice it to say, Narnia and I go back a long way, and despite my atheism I’ve devoted some time to Lewis’ milieu. Not as much as I’ve spent on Tolkien’s world, true, but still more than a little, and I’ve avidly gone to see the first two films in the series. The Lion, the Witch, and the Wardrobe was an adequate film, though it tried to make the story more epic than it deserved. (Avoid the extended cut of Lion; it only bloats the film needlessly.) Prince Caspian made a valiant, though ultimately flawed, effort at making something sensible out of the very weak source material, but its heart was certainly in the right place. Hence, I looked forward to the long-awaited third movie in the Narnia film series, The Chronicles of Narnia: The Voyage of the Dawn Treader. Dawn Treader takes place, both on Earth and in Narnia, a few years after the events of Prince Caspian. England is still suffering under deprivations thanks to World War II, and the Pevensies are scattered — older siblings Peter and Susan are in America with their parents, while younger siblings Lucy and Edmund remain behind in England to stay with their annoying cousin Eustace Clarence Scrubb who knows of Narnia (thanks to stories he’s heard) but thinks that Lucy and Edmund are decidely mental. But when a painting of a square-rigged ship at sea magically comes to life and floods Eustace’s home, the two Pevensies and their cousin are pulled into Narnia and embark on an adventure that will force them to confront their deepest fears and take them to the edge of the world. Narnia, after two adventures of a world in turmoil, stands at peace. Caspian has unified the land, and he now has embarked on a quest to find the Seven Lords of Narnia, staunch allies of his father, King Caspian IX, who were banished across the sea by Caspian’s uncle, Miraz. Outfitting and crewing a ship, the Dawn Treader, he has set sail in search of the Seven Lords to bring them back to Narnia. In the midst of the ocean, they find the Pevensies and Eustace, and together they find that a green mist eminating from the Evil Isle, is kidnapping Narnia’s loyal citizens. Only by finding the seven magical swords of the Seven Lords and overcoming their fears can Caspian, Edmund, and Lucy defeat the magic that lurks in the Evil Isle and rescue the lost Narnians. The nature of the source material — an Odyssey-like quest — allows Dawn Treader to be its own thing, rather than the Lord of the Rings-lite that the previous two films tried very hard to be. With much of the story set at sea, with a variety of landscapes visited, this film feels very open. The story did feel a bit slight and despite valiant efforts the episodic storyline never quite coheres, but that’s an artifact of the book (and even director Michael Apted admitted that changes to the source material had to be made simply to make it work). Dawn Treader leaves unfired guns on the mantelpiece; I was expecting Lucy’s cordials to play a role at some point after they were introduced early in the film, and after the suspicion of a mutiny is thrown out for the ninth or tenth time by Lord Drinian when it doesn’t happen it’s surprising. Finally, the nature of the story — go here, do something; go here, do something else — leaves the story feeling disjointed; it’s pretty, it’s energetic, but the story doesn’t linger. In general, the character work in Dawn Treader isn’t as strong as it should be. Caspian, after being so strong in Prince Caspian, is shoved into the background more than he should be, and when the other characters are faced with moments of temptation, Caspian’s vision — his father berates him as a failure — is comparatively weak. A late moment of bonding between Caspian and Edmund doesn’t feel earned; one obvious solution to the problem would have been to play up how Caspian and Edmund, who both harbor fears of failing to live up to their family and their potential, find common ground because of that, but nothing quite like that ever happens. Edmund faces temptation in the form of the ghostly apparition of the White Witch, but Edmund’s secrecy on the point feels uncharacteristic after the events of Lion (where his temptation led to all sorts of bad ends) and Prince Caspian (where he had faced the temptation). By contrast, Lucy’s temptation — to become her sister, Susan — is handled surprisingly well, and it presages Susan’s fate in The Last Battle; in a way, Lucy receives a vision of what would become of her if she became like Susan — or, rather, how Lucy perceives Susan). And newcomer Eustace is handled with aplomb; his sardonic narration holds the story together, he’s quite funny in his reactions to everything, and his character growth — when he becomes a dragon and finds his heroic heart — is the film’s real highlight. The film’s ending, on the shores of Aslan’s Country, was moving; I’ll even admit to shedding tears. Yes, I found the staging somewhat reminiscent of the scene at the Grey Havens in The Return of the King — at last, we come to a Lord of the Rings-lite moment — but what follows was done quite well — Reepicheep passing beyond Narnia into Aslan’s Country, the return of the Pevensies to Earth and the look of genuine pain and anguish when they have returned at the knowledge of what they have lost in never being able to return to Narnia. There’s some question as to whether or not there will be another Chronicles of Narnia film after this. Disney, who coproduced the first two, bailed on producing the third when they saw diminishing returns on Prince Caspian. Fox coproduced Dawn Treader, but at a lower budget, and early box office returns are not encouraging for a fourth film, The Silver Chair. If Narnia comes to an end with Dawn Treader, the film provides a suitable sense of closure; the story of the Pevensies and Narnia is, to all appearances, done (well, until The Last Battle, but we’ll leave that for another time). That said, I think the film series could carry on, quite easily, with Eustace; Will Poulter was certainly compelling and charismatic enough, and Caspian, a decade older, still makes his presence felt in the next story. However, if there’s not a Silver Chair, the series does feel somewhat complete, ending as it does on a satisfactory note. Overall, I enjoyed The Voyage of the Dawn Treader. The film, despite all the criticisms above, manages to transcend its source material for a film that is well-acted, compelling in the moment, and visually arresting. Unlike The Lion, the Witch, and the Wardrobe and Prince Caspian I was never bored by The Voyage of the Dawn Treader. 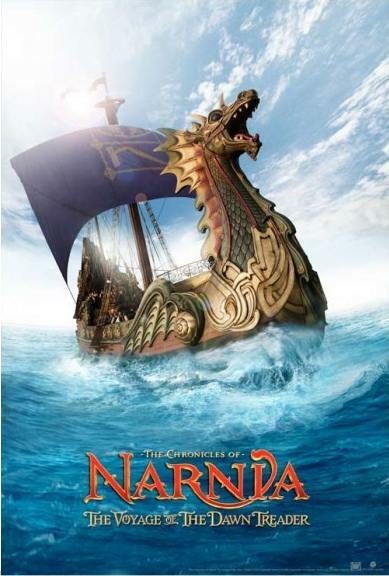 In short, I was entertained by Dawn Treader, and if the Narnia film series ends here, it sets sail on a high note.